So you are an activist trying to keep a pulse on the community you’re serving. Unfortunately, you have little time and a lot of web pages, groups, and updates to keep track of. Luckily, by using a few simple tools, you can automate away much of your busy work, leaving you more time to tackle the hard stuff. This post will show you how to use these tools to automatically monitor any web page to notify you when there are changes you might be interested in. If simple enough, subscribe with Feedly. 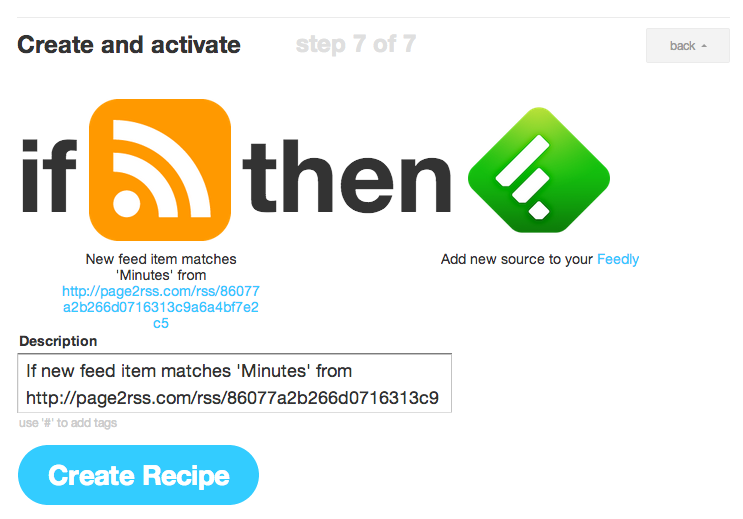 If not, create an IFTTT that filters based on one of the keywords and send to Feedly. 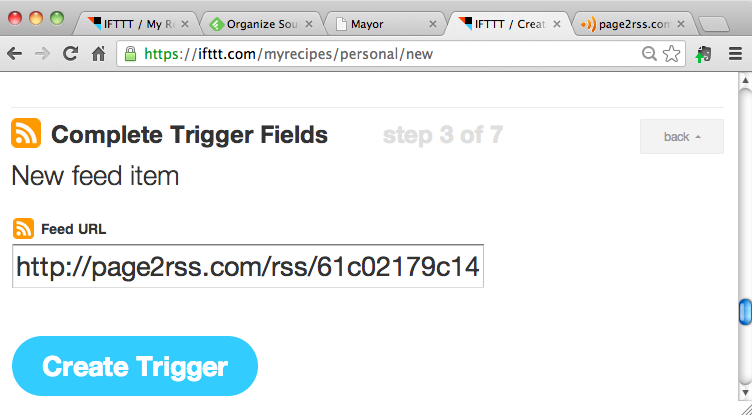 At step 3, you can also email yourself with a change, post to twitter, etc- anything that you can do in IFTTT. Quick question, Colin: what does all that jargon mean??? 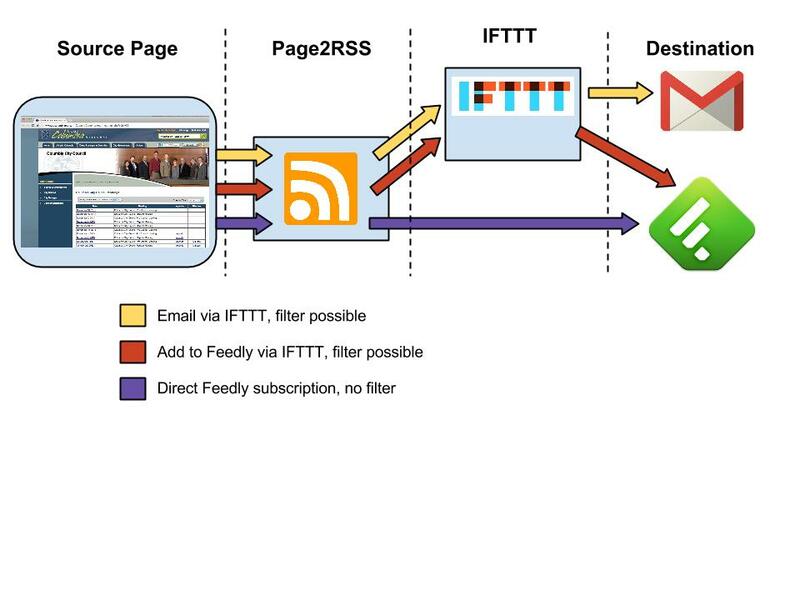 Feedly: A service like (the now dead) Google Reader which you can use to collect items from RSS feeds. 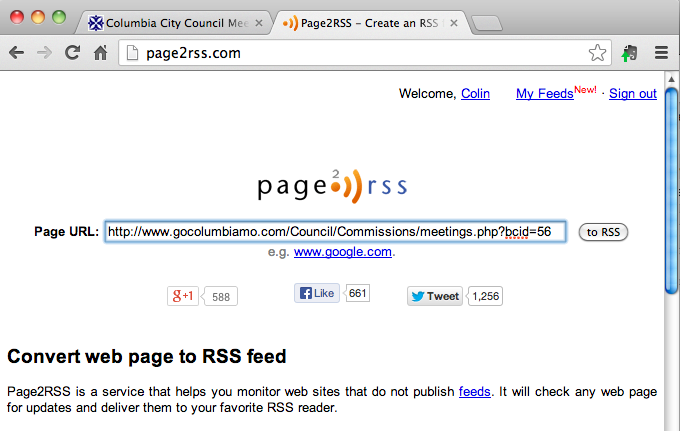 It takes care of reading the RSS feed and presenting the update in a human-readable form. 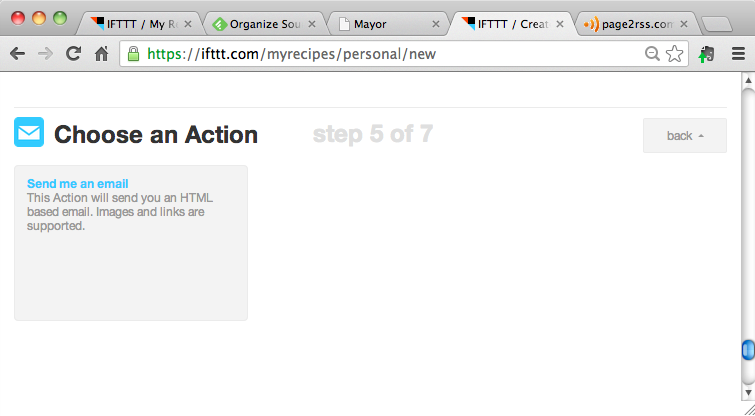 IFTTT: “If this then that”, a simple service that can hook together parts of the internet to make you a super-activist. It is worth learning this tool very well. The examples below follow these three tracks. 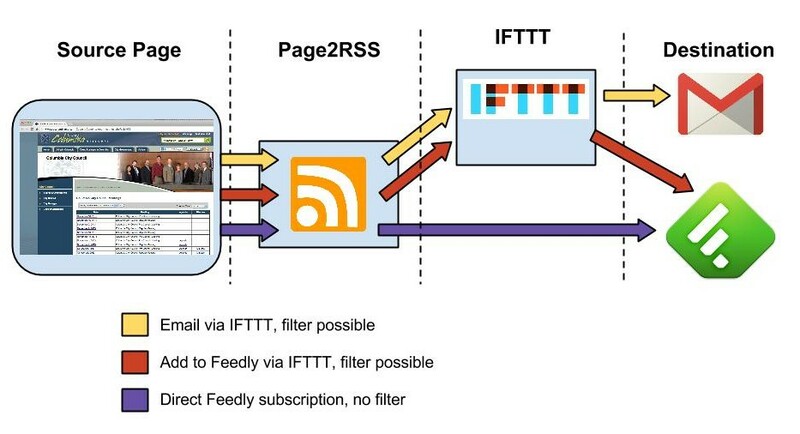 The simplest is subscribing to all changes to the page using Feedly, while the most complicated is using IFTTT to filter out only the changes you want to be notified by. Don’t worry, once you get the hang of things it’s really very simple! In this case, we are just checking for any change to the city council page, and we want an email any time it changes. This represents the yellow track above. Now, if we want to just add this to our Feedly stream, we can just click on the ‘Feedly’ button on that page and we’re done! This is the purple track in the workflow above. Click ‘Create Action’, and you’re done! Whenever that page changes, you’ll get an email. This is the yellow track in the workflow above. 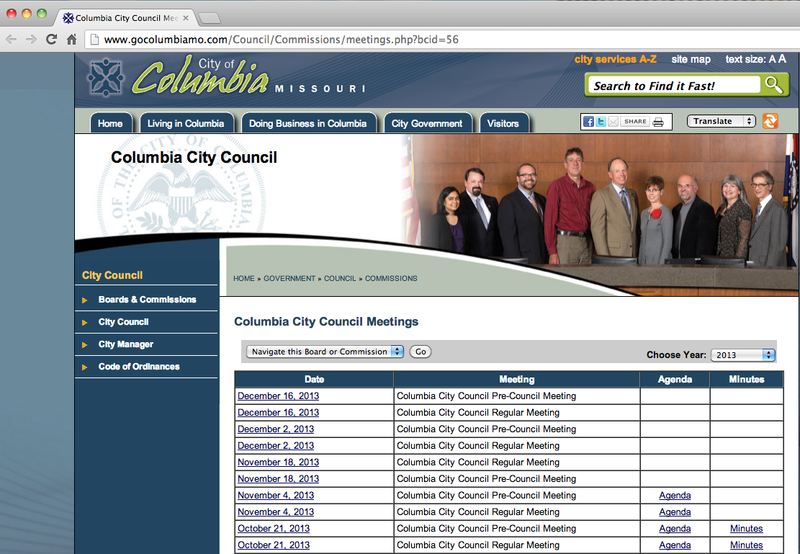 I want to know when the minutes from the latest city council meeting of Columbia, MO, are updated. 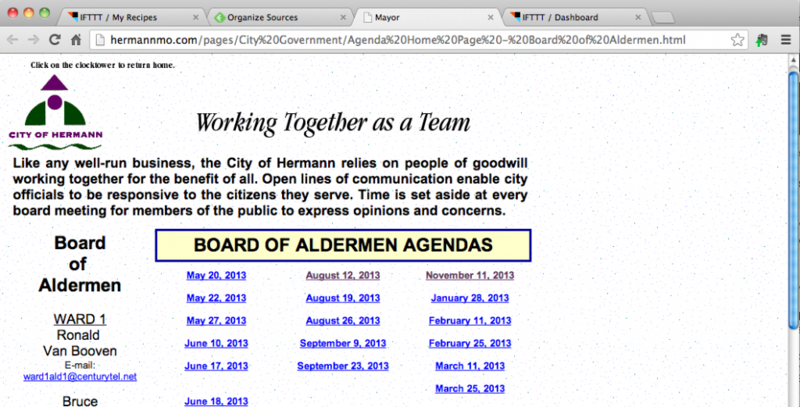 In this example, I’ll show how to only alert when the page changes in a specific way. 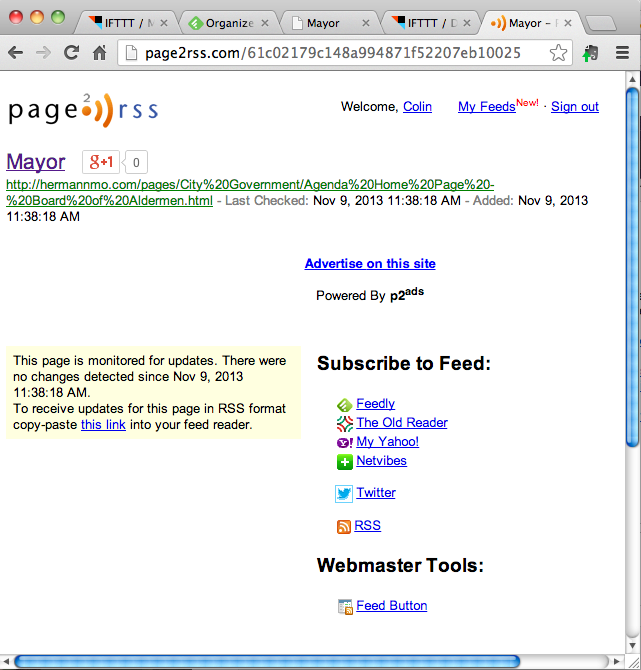 I will also have the update post to Feedly instead of emailing. This is the red track in the workflow above. Let’s say we only care about when minutes are posted, so we don’t want to just subscribe to any changes on the page. Choose the ‘then’ action. Any ‘Channel’ is possible. Let’s choose to publish to Feedly, although you could also have it send you an email you, tweet at you, text you, whatever you want! Finally, accept the new recipe, again perhaps changing the ‘description’ field to be a little more human-readable. That’s it! 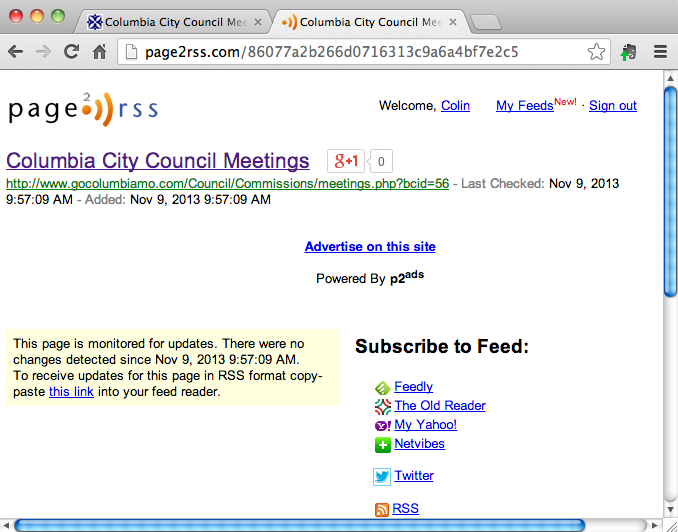 Whenever the Columbia, MO city council updates their minutes, a post will appear in your Feedly stream. 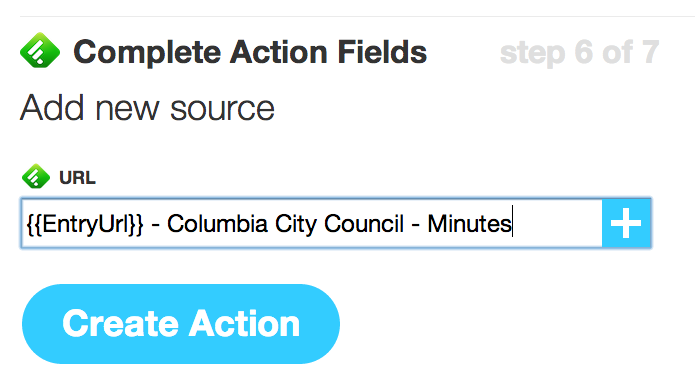 You now only need to look at your Feedly page to see which city councils have updated their minutes- no more clicking though to each town and scanning the site to see if there’s been an update. 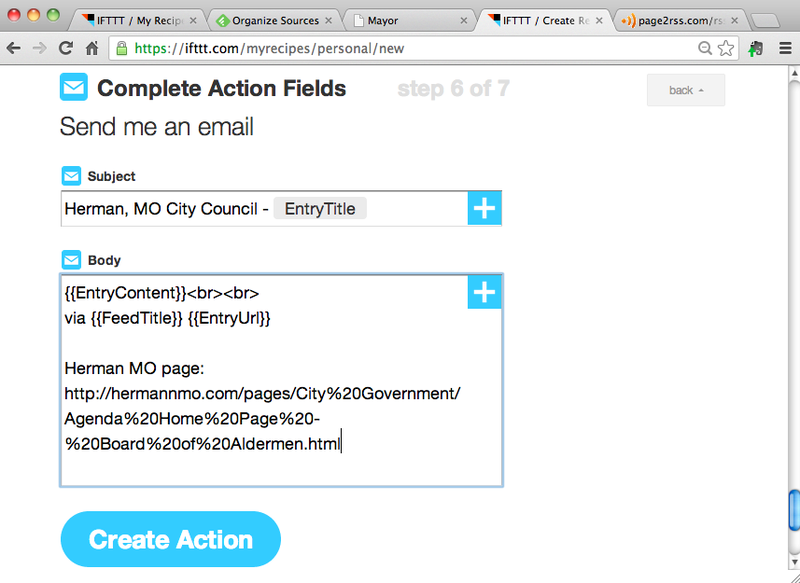 Using Page2RSS, IFTTT, and Feedly/Email, we can automate away some of the most tedious parts of activism. This helps you stay on top of any situation more quickly, and saves you time to work on more important things. Share this with your fellow activists- let’s use technology to improve our reach for the same amount of effort! If you have any questions, please comment below- I’d love to have feedback on how to improve this guide. Posted on 2013/11/10 by Schimmy. This entry was posted in green, tech. Bookmark the permalink. Great article, just saved me hours and hours of time. 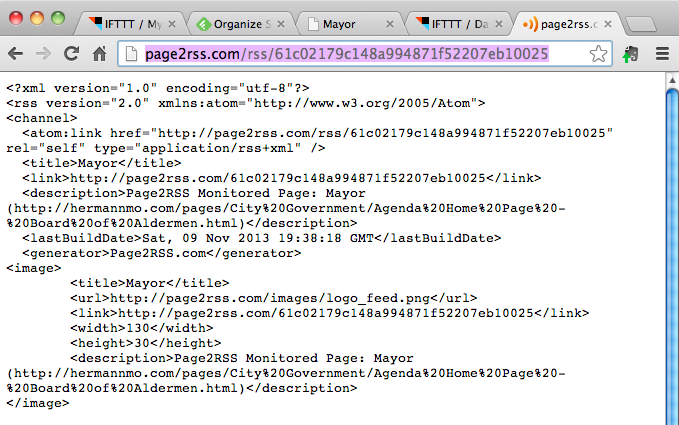 Do you know of any other solid sites that monitor pages and send back JSON or XML with the element changed? 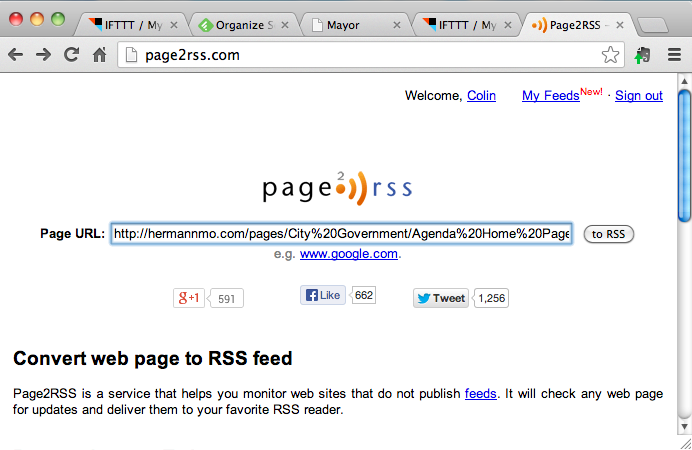 You can monitor part of page, whole page or crawl whole page with subpages. Notifications via email when page changes or any other condition you set. Cool is also that it comes with mobile apps for all platforms. 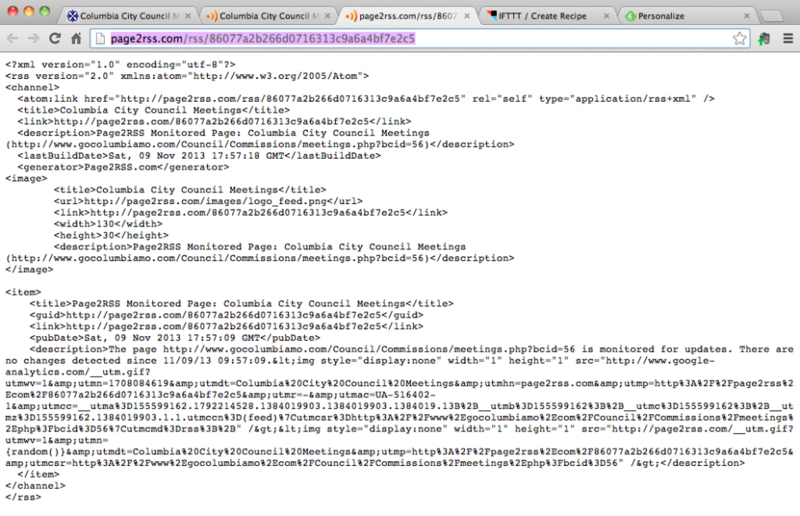 A site that I find pretty easy to use for monitoring web pages is https://pagedelta.com . I like how it emails me a screenshot of what changed.